Wall Street’s algorithms and robo-machines have been grinding out a recovery from the Christmas Eve blowout low so far this year. Today, for example, the S&P 500 Index had reached as high as 2,862.19 as of lunchtime, up nearly 1% from last Friday’s close. But that index is still no higher than it was nearly eight months ago, when it first approached these levels on the upside. We’ve been above the 200-day moving average for a month and a half. And we just closed out the best first quarter of a trading year since 1998. Meanwhile, Peak Trump on September 21, 2018, at 2,940.91, continues to fade into the rearview mirror. In an honest free market, of course, the S&P 500 wouldn’t be anywhere near 2,862. It’d be heading south under gale-force winds from all points on the global economic compass. 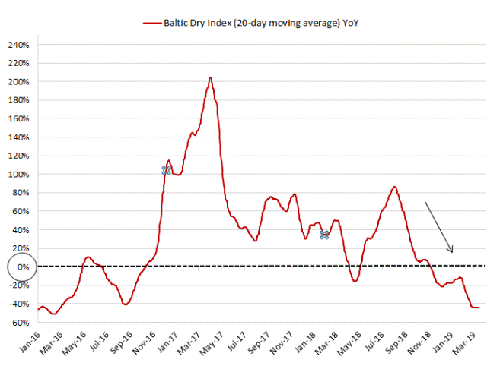 For instance, the Baltic Dry Index continues to weaken. This measure of global freight traffic is reinforcing the message from just about every monthly export report since last fall. The global economy is accelerating toward recession. That’s the case despite a full decade of extraordinary monetary central planning and massive stimulus. Indeed, South Korean exports have long been a bellwether for the world economy. And the trend since the Donald’s Trade War blew into full swing last summer couldn’t be more obvious. Global economic activity is swooning. As for the “decoupling” meme Bubblevision’s permabears love to trot out, well… we’ve been there more than once before. In the spring of 2008, those talking heads insisted what was underway was only a “pause that refreshes.” The Federal Reserve would keep Wall Street levitated and Main Street satisfied. The same pattern is now evident for Japan. This time, it’s all about the Red Ponzi. When the last Chinese credit impulse dissipated in mid-2017, once a pre-coronation economic surge was engineered, Japan’s mini export recovery also rolled over. 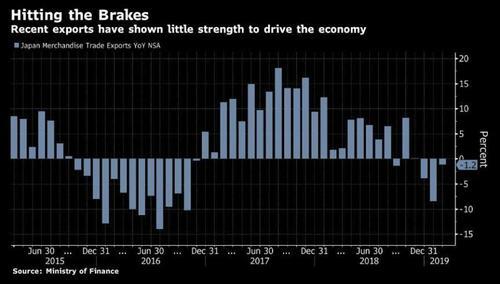 Japanese exports are heading sharply south now, too. OK, here’s the point… It’s only a matter of months before the 1% growth estimate for first-quarter U.S. domestic growth rolls over into the global drink. Still, the fact is there’s not a single rational reason for the Federal Reserve to reject “normalization” with the money-market rate still at a rock-bottom 2.4% and its balance sheet egregiously bloated at $4 trillion. There’s no plausible reading of the Humphrey-Hawkins mandate that empowers the Eccles Building to further falsify prices of financial assets based on current U.S. economic data. But the Federal Reserve has indeed signaled it’ll do everything in its monetary powers to keep things rolling in Wall Street’s favor. The impending failure of the $40 trillion Red Ponzi, a massive credit scheme to keep the Communist Party of China in power? The old-age colony that is Japan stumbling toward bankruptcy? France’s dirigisme sparking rebellion in the streets of Paris? Great Britain teetering on ungovernable? “Patient” means that we don’t feel any hurry to change our interest rate policy. What’s happened in the last 90 or so days is that we’ve seen increasing evidence of the global economy slowing down, although our own economy has continued to perform well… Generally speaking, the U.S. economy is coming off a very strong year last year… We’ve seen a bit of a slowing… But I would say the principal risks to our economy now seem to be coming from slower growth in China and Europe and also risk events such as Brexit. There is no remaining reason for the market to go higher – except that the Fed’s rate-hiking pause is permanent and “quantitative tightening” (QT) will be done by October. As of the March meeting of the Federal Open Market Committee, our central bank will have kept the real “carry trade” cost at zero or below for nearly the entire decade from the March 2009 bottom. With the end of QT, it will have monetized more than $3 trillion of debt so far in the 21st century. Wall Street is now capitalizing central bank folly. The end must surely be near.